Have you ever watched a streaming video from one of our film databases? When you watched the video, did you watch it from a mobile device, a tablet, or a desktop? Were you on-campus or off-campus? What time of day did you watch it? Interestingly enough, all of this information gathered from these questions -- and much more, can be collected from analytic reports through some of the Library’s film databases. However, two of these databases provide us with further in-depth analytics. The following graphs and information are just some of these engaging metrics that can be retrieved from the two databases, Alexander Street Videos and Kanopy. This chart shows that no matter which film database students are using, they still prefer to watch videos on a desktop computer. Mobile devices come in second, and tablets are seldom used to watch streaming films. This was a really interesting metric as it shows that most students view Alexander Street films off-campus (91%), but most students view Kanopy films on-campus (95%). Therefore, this may indicate that more faculty are posting Alexander Street films in Blackboard that students view at home and maybe more Kanopy films are being viewed in face-to-face classes on campus, or faculty are watching them while on-campus as they enhance their curriculum. 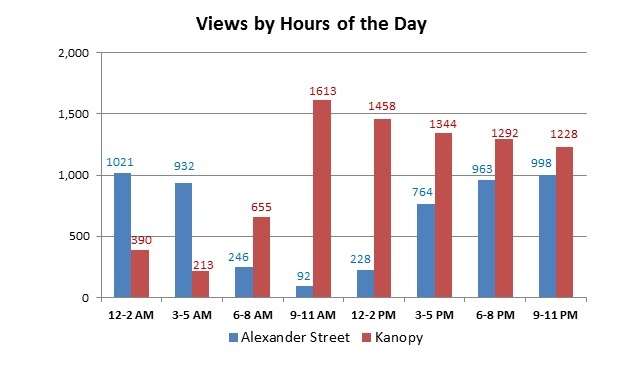 The views by hours of the day are also interesting because it does indicate that students viewing Alexander Street films tend to watch the films more in the early morning timeframe, midnight to 5:00 AM, as well as from 6:00 PM to 11:00 PM. The Kanopy films are viewed most from 9:00 AM to 11:00 AM and from noon to 5:00 PM, which would be during day classes. Other interesting analytics discovered during this research was that the top publishers or suppliers viewed in Kanopy were: Psychotherapy.net, PBS, and The Great Courses; and for Alexander Street they were: Microtraining Associates, PBS, and Psychotherapy.net. It was interesting that both the Psychotherapy.net and PBS films were frequently accessed in both databases. Therefore, this indicates with the Psychotherapy.net collection being frequently viewed that psychology students are accessing the video databases. When it comes to the operating system used to access these films, most viewers use Windows over Mac systems. Most Kanopy films are accessed from Windows 7, and Alexander Street films are accessed from Windows 10. As far as a metric that just Kanopy provides is views by country. So, the top countries viewing films from our databases were: the United States (not surprising), Israel, Mexico, Japan, and the United Kingdom. Meanwhile, Alexander Street provides analytics on browser information, with Chrome (51%), Internet Explorer (12%), and Firefox (11%), being used the most. As you can see, all of these engagement metrics provide much more information than just the number of views from each database. With analysis and interpretation of so much more data, we are able to plan ahead and provide what is accessed the most. We need to make sure that video databases are formatted for mobile devices, that students are made aware of any downtimes of these databases if it occurs during these peak viewing hours, that Windows and Chrome users can successfully access the video databases, and to possibly expand PBS and Psychotherapy.net collections.